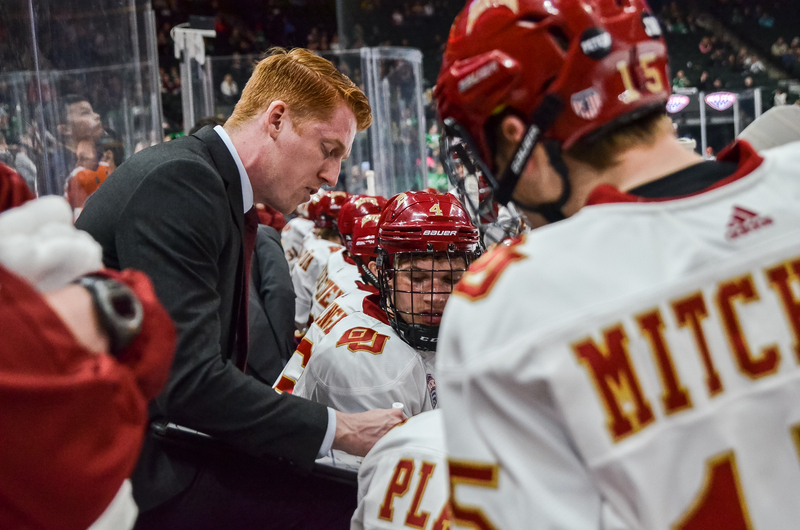 DENVER - David Carle has been named Richard and Kitzia Goodman Head Coach of the University of Denver Pioneers, Vice Chancellor for Athletics, Recreation and Ritchie Center Operations Karlton Creech announced on Friday. Carle becomes the ninth head coach in the history of the program, replacing Jim Montgomery, who was named head coach of the Dallas Stars on May 4. Carle will be formally introduced to the Denver and national media on Tuesday afternoon (May 29) at 2:30 p.m. MT in the Pat Bowlen Training Center Screening Room on the lower level of the west side of the Daniel L. Ritchie Center for Sports and Wellness. Carle, 28, becomes the youngest active head coach in NCAA Division I college hockey. The Anchorage, Alaska, native served the previous four and a half seasons as an assistant coach with the Pioneers, joining the program on January 1, 2014, following a season and a half as an assistant coach with the Green Bay Gamblers of the United States Hockey League (USHL). Prior to joining the Gamblers, Carle served four (4) seasons as a student assistant coach with the Pioneers after being diagnosed with hypertrophic cardiomyopathy, the primary disease of the myocardium muscle of the heart, and being forced to retire from his playing career. Carle graduated from the University of Denver in 2012. During his tenure as an assistant coach with the Pioneers, Carle helped Denver to a 115-51-23 record, a 66-32-14-8 mark in the National Collegiate Hockey Conference (NCHC), one (1) NCHC regular-season title, two (2) NCHC Frozen Faceoff titles, five (5) NCAA Tournament appearances, two (2) Frozen Four appearances and the 2017 National Championship. While in Green Bay, Carle helped the Gamblers to a 37-23-4 record, a second-place finish in the USHL’s Eastern Conference and a franchise record 15-consecutive wins on home ice. David Carle was a student assistant coach as an undergraduate at Denver and has been a full-time assistant the last five seasons.